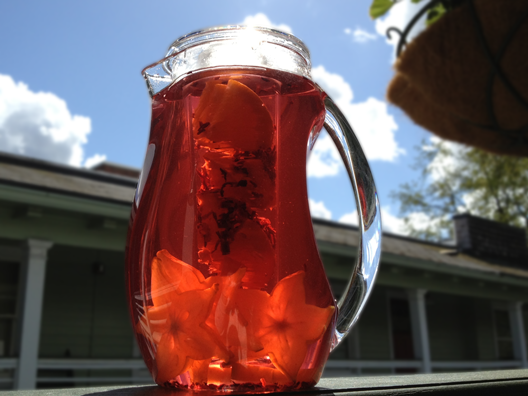 Hibiscus tea is your friend when making fruit infused waters. This flavorful flower petal turns your water a rich pink color and has a floral taste that complements fruit perfectly. You can find hibiscus at health co-ops, Whole Foods, or online. 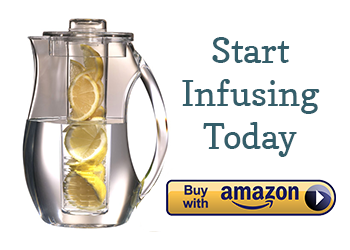 Recipe for an 80 oz infused water pitcher: 2 teaspoons loose hibiscus tea (or two bags) + 3 slices organic orange + 4 slices starfruit. Combine the orange slices and tea in your pitcher’s core, but leave the starfruit outside of the core. Chill for 4 to 12 hours and enjoy! Health benefits of hibiscus: Did you know that hibiscus can help you to lose weight and to reduce bad cholesterol? Hibiscus contains an enzyme inhibitor that blocks the amount of sugar absorbed by the body Less sugar absorbed = less pounds. Studies have also shown that hibiscus makes it more difficult for LDL cholesterol to bind to artery walls, resulting in less blockage and heart disease. So, if you thought hibiscus was just used to make your infused waters pretty, you can now enjoy this special tea twice as much. I LOVE your site!! Can you please tell me if you can literally use whole hibiscus flowers?